The ability to finally enjoy a good night's sleep is something that can be learned. An Austrian Science Fund FWF project has investigated how this can best be learned and who responds best to such "brain training". Dark circles around the eyes, tired limbs, absent-mindedness – most people have experienced the effects on the body of a short night. "Roughly one-third of the Austrian population as a whole suffers from recurrent insomnia", says Manuel Schabus from the University of Salzburg. For years now, the psychologist has been studying a diverse range of states of consciousness. In a project funded by the Austrian Science Fund FWF, Schabus and his team have now studied how the state of mind of people with sleep disorders can be improved without administering medication. "People who suffer from sleeplessness, also known as insomnia, are often in a state of 'hyperarousal'. Resorting to tablets seems to be the obvious solution", explains the researcher. However, medication-based treatments are usually for short-term use only and confine themselves to fighting this state of arousal, resulting in undesirable side effects including dependence, morningness, drowsiness or amnesia. "Medication often just reduces nocturnal brain activities and thus also helpful functions such as 'memory consolidation', which is the nocturnal stabilisation of information so that recall is easier the next day", says Manuel Schabus. The neurofeedback training deployed within the framework of the FWF project, a type of biofeedback training for the brain, guides the affected persons into sleep. So-called "sleep spindles" are used in this process. These are patterns identified in EEG measurements which are characterised by "spindle-like" rapid rising and falling brain oscillations, and which occur especially during light sleep. The preliminary studies carried out for the FWF project showed the positive effects of neurofeedback training on healthy people. This method has therefore now been tested in a pilot study on patients aged between 19 and 50 who suffer from sleep disorders. "The brain oscillations are trained during waking to a frequency range of between 12 and 15 hertz, known as the sensorimotor rhythm. This frequency range is also prominent in light sleep and manifests itself as sleep spindles, particularly when a person is falling asleep", explains Schabus. The patients were able to observe and learn to control their own sensorimotor rhythm (measured using EEG electrodes) on the computer screen. They were tasked with moving a compass needle on the screen to a green dot using only the power of mental relaxation. They received positive visual feedback each time they reached this dot, i.e. to increase the band power between 12 and 15 hertz. "Using the training, we managed to strengthen the sensorimotor rhythm in a waking state and the sleep spindles in 16 out of 24 patients with mild insomnia. Those who responded well to the training reported an improvement in the quality of their sleep. This was ascertained by self-monitoring methods like sleep diaries and importantly also verified in our sleep laboratory", says Schabus, outlining the process. Each of the participants visited the sleep laboratory a total of 21 times, which meant that the effects could be studied in great detail. The researchers were also able to establish positive effects on memory consolidation when word pairs were retested after sleep following earlier learning. 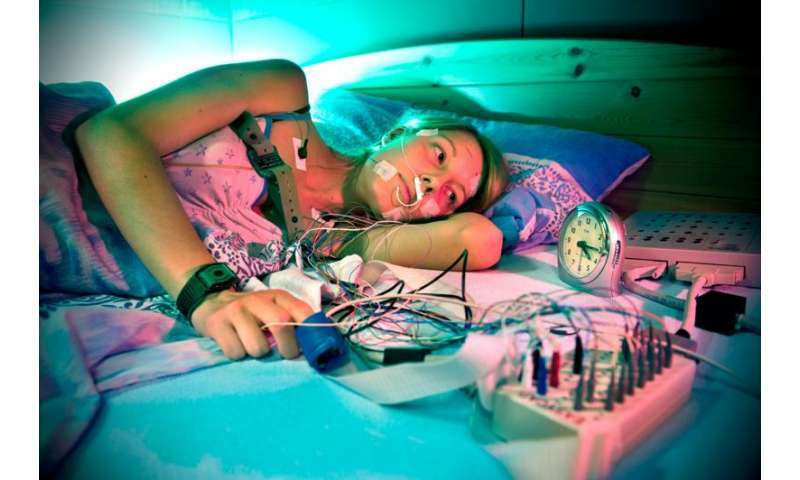 Interestingly, the subjective sleep quality among patients who successfully completed this type of biofeedback training also showed improvement, but so did people in a pure placebo condition. In general, the researcher cautions against generalising the results: in an even more extensive follow-up protocol, people with more persistent or more pronounced insomnia did not respond to the brainwave training, nor did they exhibit any positive changes in sleep or memory. "When you consider the amount of information encountered by the brain, especially the hippocampus, on a daily basis, and how sensitively it responds to stress, it is important to be mindful of treating our thinking-organ with care. Systematic training and sufficient 'sleep hygiene' not only promote well-being but also protect newly learned information from disruptive influences", says Schabus. The studies conducted as part of the FWF project play an important role in encouraging training of this vital human faculty and act as a reminder to adopt a more conscious approach to sleep. More information: Schabus et.al: "Enhancing sleep quality and memory in insomnia using instrumental sensorimotor rhythm conditioning." Biological Psychology 95 (2014) 126 –134.